The parliamentary standing committee on Law & Justice in its latest report recommended for improved regulation & standards in legal education. India currently has 1305 law colleges and 14.45 lakh advocates are registered with the various state bar councils. It is an undisputed fact that the opportunities for legal professionals have increased manifold following the liberalization of the economy. With ever increasing demand for legal education, the parliamentary standing committee on Law & Justice submitted a report on ‘Promotion of Legal Education and Research’ recently. Among other things, the committee recommended improved regulation and standards in legal education. As per the standing committee report, there are 1305 colleges across the country imparting legal education that are registered with the Bar Council of India. This comes to around one college for every million population. 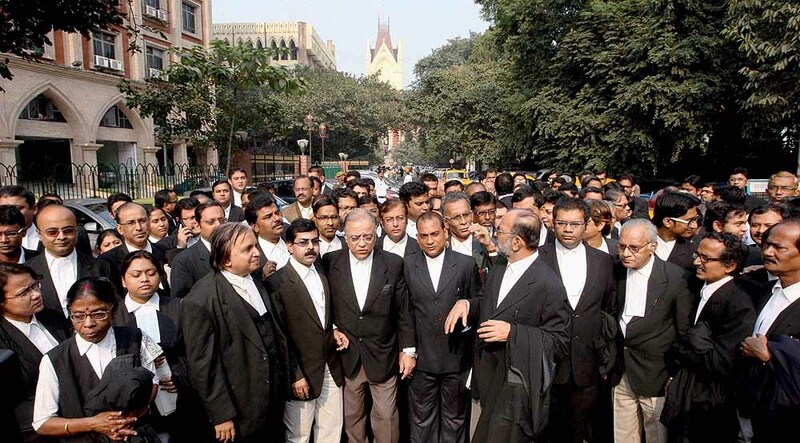 As per government estimates, about 30000 advocates join the legal profession every year. Uttar Pradesh is home to around 25% of all the law colleges in the country (320). Apart from Uttar Pradesh, only four other states (Maharashtra, Karnataka, Madhya Pradesh and Rajasthan) have more than 100 law colleges each. Surprisingly, Tamil Nadu, Bihar & West Bengal have fewer legal colleges compared to the other big states. As per the standing committee report, a total of 1445056 lawyers are registered with the various state bar councils. This comes to about 119 lawyers for every 1,00,000 population or one lawyer for every 837 people. Though India is behind US, UK and Australia in terms of the lawyers per 1,00,000 people, it is ahead of countries like China & Japan. But there are wide variations within the states. Delhi leads with 4447 lawyers per million population, almost 3 times that of Uttar Pradesh with 1522 lawyers per million population. Fourteen (14) different state bar councils have more than 1000 lawyers registered per million population. Jammu & Kashmir has only 438 lawyers per million population, the least in the country. The committee held stakeholder meetings in five different places. Various viewpoints were received from stakeholders during these meetings, some of which were conflicting in nature. Some of the important viewpoints received by the committee are the following. The brightest law graduates prefer to join the corporate law firms due to difficulty in getting good mentorship. Senior lawyers should play the role of mentor for the first-generation young law graduates and law students from under-privileged sections of society to enable them to join the Bar. Lawyers academies to be set-up in each states from the contributions of Bar members of the State. Some of them felt that the compulsory attendance of 75% for students should be done away and more practical training should be introduced in law while others felt that the attendance rule prescribed for law graduates should be strictly followed and if need be with biometric attendance systems. The curriculum and pedagogy at law schools must reflect the requirements of new demands. There is also need to introduce courses relating to tribal issues and agriculture etc. in the curriculum. There must be a separate regulatory body at national level for legal education in the lines of All India Council for Technical Education (AICTE). Bar Council of India should focus on improving the quality of Bar and regulation of quality of legal education should be left to University Grants Commission (UGC) or any other super-regulatory body on the lines of AICTE. Maximum age limit should be prescribed to pursue LL.B programs in the country as a 21 year student cannot be expected to sit in a class with 60 year. Three years law course may be abolished in phased manner. Part time law degree, law degree by correspondence may be abolished. There should be one legal standard for the institutions throughout the country. One model National law school may be set up in every State, which should be assigned the duty of regulating law colleges within that State. There should be a common National Level Aptitude Test for screening students opting for five years’ law degree in the country on the lines of NEET etc. since CLAT covers only National Law Universities. Like IITs and IIMs, the National Law Schools should be granted autonomy and status of institute of national importance/excellence for maintaining the standards of legal education in the country. There is no R & D investment in legal education sector to improve the state of affairs on quality of justice system professionals. After hearing these viewpoints, the committee recommended the overall improvement both in the standards and regulation of legal education in the country. The following are some of the important recommendations of the committee. National Law Schools set up under State legislation may be declared as institute of national eminence on the lines of IITs & IIMs and can be a role models for other law institutions to emulate their standard in research, curriculum, faculty, etc. Universities need to be given full autonomy in designing the post graduate courses to meet the market demands. National Law Schools, Law Colleges and Law Departments of the Universities need adequate financial support. The UGC should frame Rules providing for ‘fitness’ of the institutions imparting legal education on the lines of Technological and Agricultural universities etc. Basic law courses like drafting of deeds, conciliation and mediation may be made part of school curriculum in higher secondary school level. The country should move towards providing Juris Doctor (JD) program being offered in most of the common law countries like Australia, England etc. in addition to 5 years law degree. The Government of India should encourage all the States to setup Advocates Academy on the lines of State Judicial Academy for providing training to advocates in the States for an independent and integrated judiciary as envisaged under the Constitution of India. The Government of India should provide financial assistance for establishing and nurturing Advocate Academies.